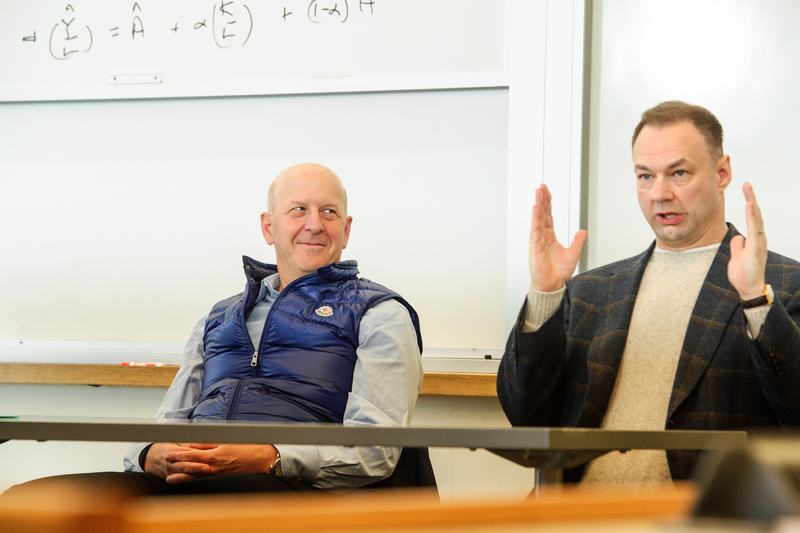 David Solomon '84, chairman and CEO of Goldman Sachs, left, and Thomas Tull '92, businessman and film producer, right, lead a Q&A with faculty and students. 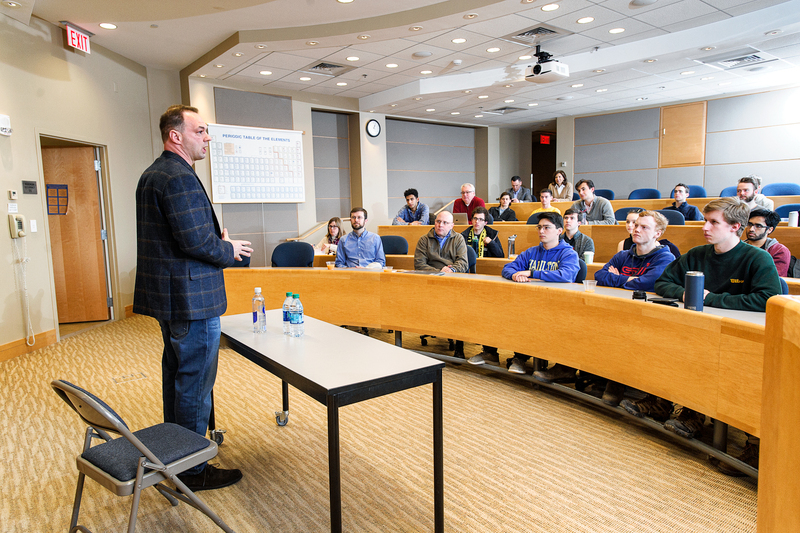 Thomas Tull '92, businessman and film producer, leads an artificial Intelligence conversation with students. 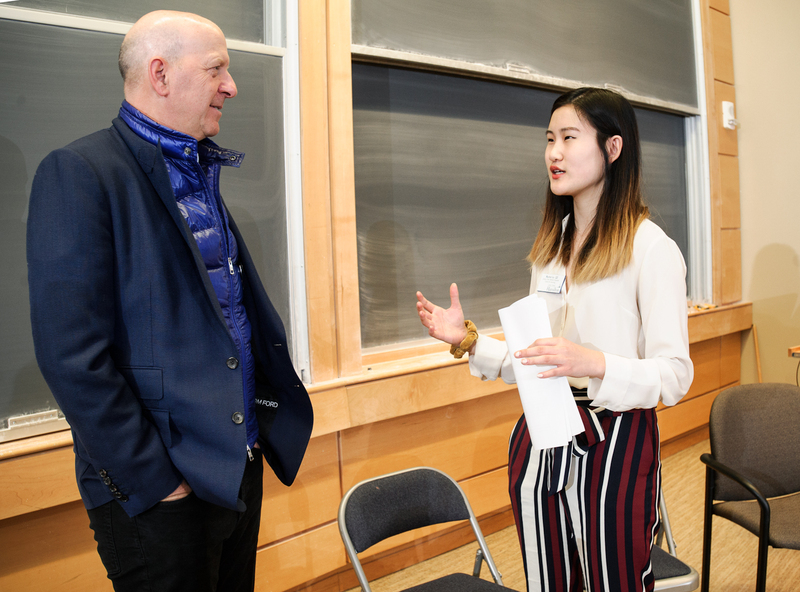 It was a chance to spend quality time on campus with an ultra-successful Hamilton graduate, and computer science major Grace Woolson ’21 took a front-and-center seat for a classroom question-and-answer session with Thomas Tull ’92, who founded and led Legendary Entertainment. These days Tull is chairman and CEO of Tulco, an investment-holding company that buys promising companies and applies data science and technology to promote their rapid, sustainable growth. 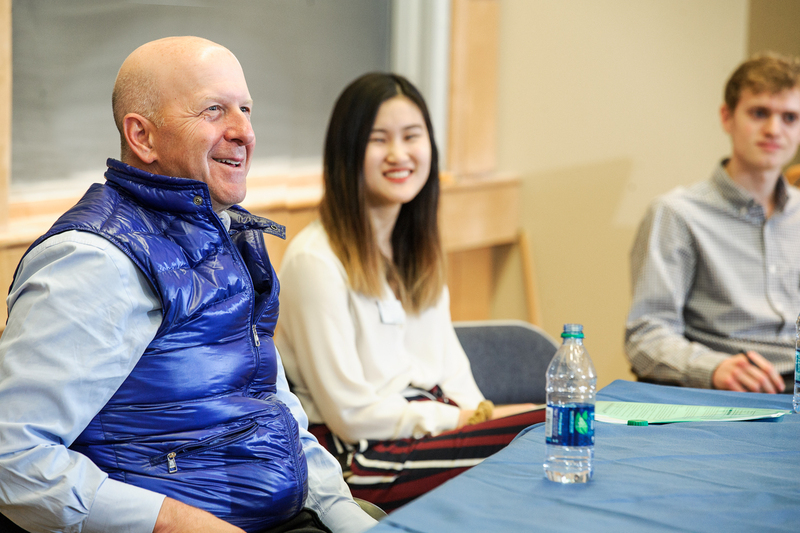 He was on campus Tuesday with another eminently successful alumnus, Goldman Sachs Chairman and CEO David Solomon ’84, for a public discussion on “Driving Innovation and Entrepreneurship with Technology." Solomon, too, met with small groups of students prior to the 7 p.m. public discussion, which can be viewed on Hamilton's YouTube page. Woolson and the other computer science students had done their homework on Tull's background and kept the questions coming after he introduced himself. 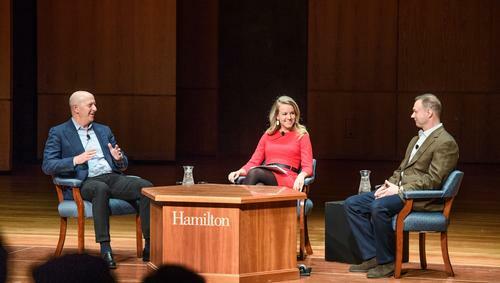 “I’m interested in hearing about his transition from Hamilton to Legendary Entertainment and then deciding to start a holding company that works heavily with technology, because that really speaks to the diversity of a liberal arts education and also to the growing impact of technology on everything,” said Woolson as she waited for the session to begin. 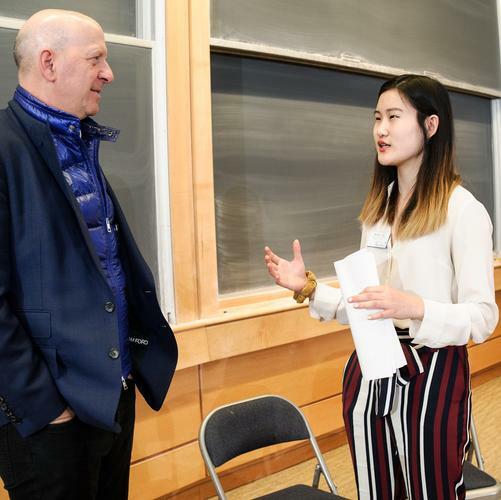 She and the other students in the Science Center classroom heard all that and more from Tull, who told them that he became interested in the movie industry when data analytics showed him he could succeed there. Which he did, selling Legendary three years ago for nearly $4 billion. His movies include the Dark Knight trilogy and the Hangover franchise. After Tull spoke with the computer science students, he joined Solomon for a meeting with economics students about technology and innovation. Next up for Solomon was meeting at the Career Center with students interested in finance, while Tull toured athletic facilities with student athletes. Students in both q-and-a sessions had big-picture questions for the two experts. 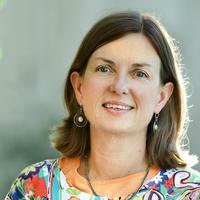 How much space is there for creating new technology versus implementing existing technology? How does society establish transparency and standards for technology that may be incomprehensibly complex? Is the United States the best place in which to be an entrepreneur or are there other countries that can beat it? That last question came from economics major Hunter Reynolds ’19. “I liked how Mr. Solomon mentioned wanting to preserve the economic climate that allows for entrepreneurship in the U.S. because when you look at the global scale, that’s kind of a unique thing that we have. China [has] a bit, but their government regulation seems to step in the way sometimes. It’s very interesting,” Reynolds said. Proximity to Solomon and Tull, who are both Hamilton trustees, was definitely a moment for Reynolds. When he first heard that the two would be meeting with students on campus, Reynolds envisioned them as 10 feet tall. “But then you realize they are people, and maybe I could be there one day,” he said.